We're here to provide you the best and most-up-to-date information to assist you in buying your home! The following is a list of documents you may be asked to provide during the mortgage application process. The documents listed here are general and may not include all documents specific to your home mortgage financing situation. Your mortgage consultant will inform you of any additional documentation that you may need. Ready to purchase your first home? Use this list to help you find your dream home! Think through your "must haves", "nice to haves" and "someday" wishes for your home. Use this list of the best mobile apps to help you with everything in the homebuying process, from getting financially ready to designing your new space. 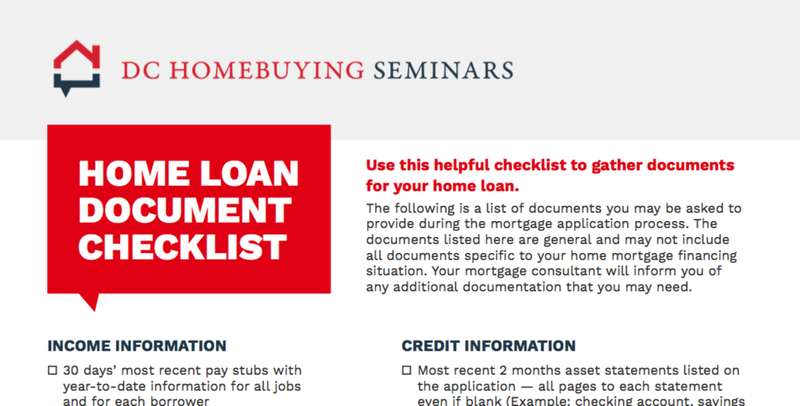 This document covers what you need to know about the lending and buying process. Look here for quick info on everything from types of loans, to interest rates, to home appraisals, and what to expect on closing day. Interested in buying a new home but not sure you have funding for the down payment? Get creative with the list of 14 potential sources of down payment money. 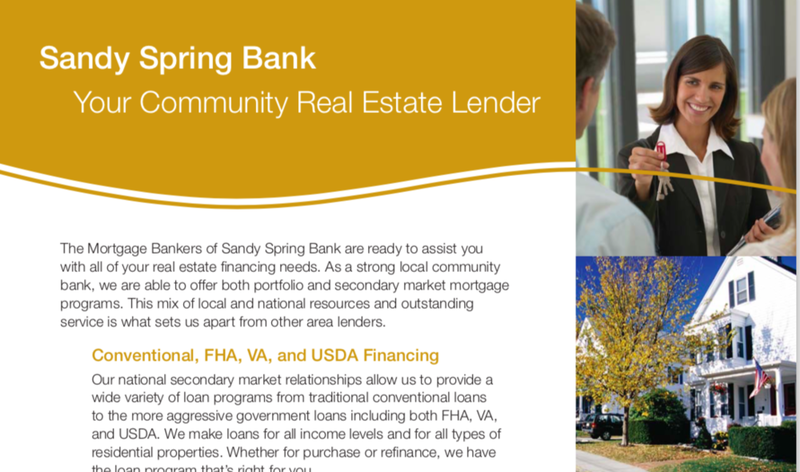 A quick snapshot of the mortgage resources available to you through local community lender Sandy Spring Bank and VP and Sales Manager Joe Zamoiski. Our first time home buyer classes are fun, educational sessions designed to give an overview of current market conditions and the home buying process. We are a unique partnership of top professionals in the DC Mortgage, Real Estate and Settlement industries to provide you with stellar customer service. You will learn all you need to know to become a savvy buyer! Learn and give back. All seminar proceeds are donated to a local charity, as voted on by the seminar attendees. Sandy Spring Bank is a Maryland Corporation headquartered at 17801 Georgia Avenue in Olney, Maryland 20832. As a residential lender we provide mortgage financing in the metropolitan Washington D.C. and greater mid-Atlantic markets. This website does not create a partnership, joint venture, or agency relationship between Sandy Spring Bank, a real estate professional, or title company.